Received May 31, 2018; Revised July 23, 2018; Accepted August 10, 2018.; Published online August 29, 2018. Significant research efforts are ongoing to elucidate the complex molecular mechanisms underlying amyotrophic lateral sclerosis (ALS), which may in turn pinpoint potential therapeutic targets for treatment. The ALS research field has evolved with recent discoveries of numerous genetic mutations in ALS patients, many of which are in genes encoding RNA binding proteins (RBPs), including TDP-43, FUS, ATXN2, TAF15, EWSR1, hnRNPA1, hnRNPA2/B1, MATR3 and TIA1. Accumulating evidence from studies on these ALS-linked RBPs suggests that dysregulation of RNA metabolism, cytoplasmic mislocalization of RBPs, dysfunction in stress granule dynamics of RBPs and increased propensity of mutant RBPs to aggregate may lead to ALS pathogenesis. Here, we review current knowledge of the biological function of these RBPs and the contributions of ALS-linked mutations to disease pathogenesis. Amyotrophic lateral sclerosis (ALS) is a fatal neurodegenerative disorder characterized by progressive degeneration of motor neurons in the brain and spinal cord, leading to muscle weakness, paralysis and death (Rowland and Shneider, 2001). Although the underlying cause is unknown for most ALS cases, advances in sequencing technology have allowed the identification of more than one hundred genes associated with ALS, including approximately thirty potential ALS-causing drivers (Al-Chalabi et al., 2017; Guerreiro et al., 2015; Wroe et al., 2008). Interestingly, many of the genes implicated in ALS encode RNA-binding proteins (RBPs), which include transactive response DNA-binding protein 43 (TDP-43), fused in sarcoma/translocated in liposarcoma (FUS/TLS or FUS), ataxin-2 (ATXN2), TATA-box binding protein associated factor 15 (TAF15), Ewing’s sarcoma breakpoint region 1 (EWSR1), heterogeneous nuclear ribonucleoprotein A1 (hnRNPA1), heterogeneous nuclear ribonucleoprotein A2/B1 (hnRNPA2/B1), matrin 3 (MATR3) and T-cell-restricted intracellular antigen-1 (TIA1). As shown in Fig. 1, these RBPs share structural similarities; they all contain one or more RNA-binding domains (e.g., RRM, Lsm or LsmAD), a glycine (Gly)-rich region (except for MATR3 and ATXN2), and a nuclear localization signal (NLS) (except for TIA1 and ATXN2). In addition, these RBPs share functional similarities, since they are involved in RNA metabolism and many localize to stress granules upon cellular stress. Stress granules are membrane-less discrete cytoplasmic structures containing mRNA and associated proteins that form as a protective response to stress (Buchan and Parker, 2009; Kedersha et al., 1999; Monahan et al., 2016). Interestingly, the stress granule proteome was shown to be enriched for proteins encoding predicted prion-like or low-complexity (LC) domains, including many ALS-linked RBPs (Jain et al., 2016; Monahan et al., 2016). Mutations within these LC domains have been shown to interrupt stress granule dynamics and increase aggregation or fibrillization, which suggests a potential mechanism for ALS pathogenesis. Indeed, an increasing number of mutations identified in RBPs strongly suggest that abnormal RBP function and dysregulated RNA homeostasis also lead to ALS pathogenesis. Much progress has been made in understanding the mechanisms of how mutant RBPs exert toxicity and lead to neurodegeneration in ALS. In this review, we summarize studies that have investigated the biological function of the potential ALS-driving RBPs and the mechanisms by which mutations in these RBPs cause ALS. Where available, we discuss what we have learned from ALS models, with a focus on mouse models. TDP-43 is an RBP containing two RNA recognition motifs (RRMs), an NLS, a nuclear export signal (NES), and a Gly-rich region at the C-terminus (Fig. 1) (Buratti and Baralle, 2001; Winton et al., 2008). TDP-43 plays a role in transcription, alternative splicing and mRNA stability and is involved in various cellular processes, such as apoptosis, cell division and axonal transport (Buratti and Baralle, 2008). TDP-43 primarily binds to UG-rich regions in the introns of pre-mRNA, particularly long introns (Polymenidou et al., 2011; Sephton et al., 2011; Tollervey et al., 2011; Xiao et al., 2011), and its depletion leads to significant changes in alternative splicing and cryptic splicing (Ling et al., 2015; Polymenidou et al., 2011; Tan et al., 2016; Tollervey et al., 2011). TDP-43 is primarily localized in the nucleus; however, upon cellular stress, it localizes to stress granules (Buratti and Baralle, 2008; Colombrita et al., 2009; Li et al., 2013). In 2006, TDP-43 was identified as a major component of protein inclusions in the cytoplasm of ALS-affected motor neurons, marking it as the first RBP associated with ALS (Arai et al., 2006; Mackenzie et al., 2007; Neumann et al., 2006). Corresponding with abnormal cytoplasmic inclusion, nuclear clearance of TDP-43 was also observed (Neumann et al., 2006; Van Deerlin et al., 2008). This finding raises the question of whether TDP-43 pathogenicity is due to loss of nuclear function, gain of cytoplasmic function, or both. Numerous TDP-43 mutations have been identified in ALS patients, accounting for approximately 5% of familial and less than 1% of sporadic cases (Taylor et al., 2016). Most mutations are clustered in the Gly-rich domain (Fig. 1) (Kapeli et al., 2017; Sreedharan et al., 2008). The Gly-rich, LC domain has been shown to be necessary for TDP-43 assembly into stress granules (Colombrita et al., 2009) and for undergoing liquid-liquid phase separation (or phase separation) (Aguilera-Gomez and Rabouille, 2017; Anderson and Kedersha, 2009; Brangwynne et al., 2009; Chong and Forman-Kay, 2016; Conicella et al., 2016). This process is dynamic, as proteins can transition between liquid and gel-like states (recently reviewed in (Purice and Taylor, 2018)). However, TDP-43 proteins that harbor disease mutations in the LC domain were shown to favor the gel-like, rigid state and form aggregates (Conicella et al., 2016). Additionally, these mutant TDP-43 proteins increased the formation of stress granules upon oxidative stress induced by sodium arsenite (Liu-Yesucevitz et al., 2010). As many other studies have demonstrated that ALS mutations in the LC domain results in increased conversion to aggregates (Kapeli et al., 2017; Purice and Taylor, 2018), phase separation disruption is a possible mechanism leading to ALS. In addition to full length TDP-43, low molecular weight species containing the LC domain (e.g., TDP-35) were also found to localize to cytoplasmic inclusions in ALS motor neurons (Xiao et al., 2015), further supporting that this LC domain is critical for aggregation. In parallel, other studies have shown that dysregulation in RNA splicing due to loss of TDP-43 function may be involved in ALS pathogenesis. One example demonstrated by Ling and colleagues showed that cryptic exon inclusion induced by loss of TDP-43 is found in ALS patients presenting TDP-43 pathology (Ling et al., 2015). Many transgenic mice and rats expressing mutant TDP-43 have been generated; most of which reproduce clinical features seen in ALS patients including impaired motor function, degeneration of motor neurons, and accumulation of ubiquitinated TDP-43 cytoplasmic aggregates (Liu et al., 2013; Picher-Martel et al., 2016; Wegorzewska et al., 2009). Loss of TDP-43 was found to cause age-dependent motor neuron degeneration in mice and many other animal models (Iguchi et al., 2013; Vanden Broeck et al., 2014), suggesting that loss of TDP-43 function is involved in ALS pathogenesis. However, it is still not clear to what magnitude gain-of-function and loss-of-function contribute to neurodegeneration. FUS was first identified as an oncogene that causes liposarcomas, where chromosomal translocation fuses the FUS transactivation domain to transcription factors (Crozat et al., 1993; Kapeli et al., 2017; Rabbitts et al., 1993). In addition to its role in transcription, FUS plays a role in RNA processing events. Cross linking immunoprecipitation coupled with high-throughput sequencing (CLIP-seq) analysis revealed that FUS binds to RNAs that contain an enriched GUGGU motif (Lagier-Tourenne et al., 2012) or GUU motif (Rogelj et al., 2012). FUS-binding sites are clustered in RNAs with exceptionally long introns, and depletion of FUS leads to downregulation of long intron-containing FUS targets (Lagier-Tourenne et al., 2012). Mutations in FUS were reported to cause ALS in 2009 (Kwiatkowski et al., 2009; Vance et al., 2009). FUS is normally localized primarily in the nucleus, but in ALS-affected brains and spinal cords, FUS is often found aggregated in the cytoplasm. Interestingly, TDP-43 pathology is absent in ALS patients with FUS mutations (Vance et al., 2009). FUS mutations account for 5% of familial ALS and less than 1% of sporadic ALS cases (Taylor et al., 2016). The average age of onset for ALS cases with FUS mutations is 43.6 ± 15.8 years, which is relatively earlier than that of patients with SOD1 or TDP-43 mutations (Shang and Huang, 2016; Yan et al., 2010). In addition, many FUS mutations were found in juvenile ALS cases (late teens and early 20s) (Baumer et al., 2010; Huang et al., 2010; Liu et al., 2017b). Most of the mutations identified in FUS are clustered in either the N-terminal glutamine-glycine-serine-tyrosine (QGSY)-rich and Gly-rich regions or the C-terminal region within the arginine-glycine-glycine (RGG)-rich domain and NLS (Fig. 1). Several groups have demonstrated that ALS mutations accelerate the phase transition of FUS and readily lead to formation of nuclear and cytoplasmic aggregates (Murakami et al., 2015; Patel et al., 2015). In addition, ALS-linked FUS mutants have shown increased localization to stress granules upon cellular stress (Bosco et al., 2010). Recently, the detailed structural and molecular mechanism of the phase behavior of FUS has been further investigated (Hofweber et al., 2018; Luo et al., 2018; Murray et al., 2017; Qamar et al., 2018; Yoshizawa et al., 2018), providing additional support for aberrant phase transition as a molecular mechanism leading to disease. Several mouse and rat models that express mutant FUS recapitulate ALS features, including cytoplasmic inclusions, muscle atrophy, and motor neuron degeneration (Qiu et al., 2014; Sephton et al., 2014; Sharma et al., 2016; Shelkovnikova et al., 2013). Similarly, mice overexpressing wild-type FUS also exhibit ALS features (Mitchell et al., 2013; Sephton et al., 2014), suggesting that increased levels of FUS contribute to toxicity and neurodegeneration. Interestingly, neither widespread postnatal FUS deletion nor motor neuron-specific FUS knockout mice develop motor neuron degeneration (Sharma et al., 2016), suggesting that loss of FUS function does not contribute to ALS. However, studies in other animal models such as Drosophila and C. elegans suggest that loss of FUS function may be involved in pathogenesis (Lanson and Pandey, 2012; Shang and Huang, 2016). Qiu and colleagues performed RNA-seq on spinal cord tissue of FUS-R521C mice and found RNA splicing defects, particularly in genes that are involved in dendritic growth and synaptic functions (Qiu et al., 2014), suggesting that aberrant RNA splicing caused by mutant FUS contributes to neurodegeneration. In addition, RNA analysis of motor neurons derived from induced pluripotent stem cells (iPSCs) with ALS mutations in FUS revealed that aberrant gene expression and splicing changes are associated with mutant FUS (De Santis et al., 2017; Ichiyanagi et al., 2016). These results suggest that dysregulation of RNA metabolism is involved in ALS pathogenesis. ATXN2 plays diverse roles in the regulation of RNA metabolism, including mRNA stability, polyadenylation and translational activation (Auburger et al., 2017; Carmo-Silva et al., 2017; Lee et al., 2018a; Ostrowski et al., 2017). ATXN2 contains an N-terminal like-Sm protein domain (Lsm) and Lsm-associated domain (LsmAD), which bind to the 3′ UTR of mRNA and promote mRNA stability (Yokoshi et al., 2014). In addition, ATXN2 is involved in translational regulation by associating with polyribosomes and poly (A)-binding protein (PABP) through its C-terminal PABP-interacting motif 2 (PAM2) domain (Ralser et al., 2005; Satterfield and Pallanck, 2006). ATXN2 is predominately found in the cytoplasm and localizes to stress granules upon stress (Nonhoff et al., 2007; Ralser et al., 2005). ATXN2 is also involved in reorganization of the actin cytoskeleton and regulation of calcium signaling, cellular metabolism and circadian rhythm (Auburger et al., 2017; Carmo-Silva et al., 2017; Lee et al., 2018b; Lim and Allada, 2013; Ostrowski et al., 2017). ATXN2 normally contains ~22 polyglutamine (polyQ) repeats in the N-terminus (Fig. 1), and an expansion of >34 polyQ repeats causes spinocerebellar ataxia type 2 (SCA2) (Imbert et al., 1996). In 2010, intermediate-length polyQ repeats (27–33), which were found in up to 4.7% of ALS cases, were identified as a significant risk factor for ALS, although the cutoff length of the polyQ expansion varies between populations (Conforti et al., 2012; Elden et al., 2010; Lee et al., 2011; Lu et al., 2015; Ross et al., 2011; Van Damme et al., 2011). Similar to other ALS-linked RBPs, distinct cytoplasmic accumulation of ATXN2 was observed in spinal cord autopsies of ALS patients, which differs from the diffuse pattern observed in control tissue (Elden et al., 2010). The link between ATXN2 and ALS was first discovered using yeast two-hybrid screens, which identified ATXN2 as a TDP-43 modifier (Elden et al., 2010). Up-regulation of ATXN2 enhanced TDP-43 toxicity in yeast and flies, while a decrease in ATXN2 levels suppressed TDP-43 toxicity, a feature also observed in mice (Becker et al., 2017; Elden et al., 2010), strongly suggesting that reducing ATXN2 levels is an attractive therapeutic strategy to mitigate ALS. Similarly, expression of mutant ATXN2 enhances mutant FUS toxicity (Farg et al., 2013). A very recent study has identified domains in ATXN2 that are required for phase separation and stress granule assembly as well as long-term memory and neuro-degeneration (Bakthavachalu et al., 2018). Relative to the other RBPs discussed, the distinct structure and function of ATXN2 speaks to the complex molecular mechanism of ALS. TAF15 is composed of an N-terminal QGSY-rich domain, Gly-rich region, an RRM, a zinc finger motif (Znf), a C-terminal RGG repeat region, and an NLS (Fig. 1) (Andersson et al., 2008; Bertolotti et al., 1996; Morohoshi et al., 1996). Although TAF15 is found primarily in the nucleus, it localizes to stress granules upon cellular stress (Andersson et al., 2008; Marko et al., 2012). TAF15 has been implicated in DNA damage repair and RNA processing (Bertolotti et al., 1996; Ibrahim et al., 2013; Izhar et al., 2015; Jobert et al., 2009). Several studies were unable to identify a consensus RNA-binding sequence and proposed that TAF15 binds to stem-loop structures within intronic regions (Hoell et al., 2011; Kashyap et al., 2015). However, other studies have suggested that TAF15 binds to the CUG motif or GGUA motif (Ibrahim et al., 2013; Kapeli et al., 2016). Interestingly, TAF15 and FUS share common RNA targets (Hoell et al., 2011; Ibrahim et al., 2013; Kapeli et al., 2016), supporting that TAF15 and FUS are structurally and functionally similar. 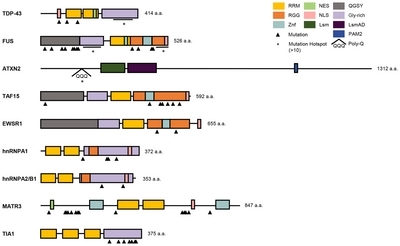 In 2011, mutations in TAF15 were identified in familial ALS cases (Ticozzi et al., 2011). Couthouis and colleagues identified additional mutations within the RGG-rich domain in sporadic ALS patients (Couthouis et al., 2011). Punctate granular cytoplasmic TAF15 staining was observed in sporadic ALS postmortem spinal cord tissue, whereas in postmortem controls, TAF15 is localized in the nucleus (Couthouis et al., 2011). ALS-linked mutations were also shown to increase the aggregation propensity of TAF15 compared to that of wild-type TAF15 (Couthouis et al., 2011). Furthermore, Couthouis and colleagues found that overexpression of wild-type TAF15 led to shortened lifespan in Drosophila, and ALS-associated mutations reduced lifespan even further (Couthouis et al., 2011), suggesting a possible gain-of-function mechanism. EWSR1 or EWS was originally identified in Ewing’s sarcoma, in which chromosomal translocation fuses the N-terminus of EWSR1 to a transcription factor (Delattre et al., 1992). EWSR1 is composed of an N-terminal QGSY-rich domain, a Gly-rich domain, an RRM, a C-terminal RGG-region divided by a Znf, and an NLS (Fig. 1) (Bertolotti et al., 1996; Ohno et al., 1994; Zakaryan and Gehring, 2006). Like other RBPs detailed above, EWSR1 is primarily found in the nucleus but can localize to stress granules upon cellular stress (Andersson et al., 2008; Neumann et al., 2011). One study failed to identify an RNA consensus sequence for EWSR1 and proposed that it recognizes a stem-loop structure within intronic sequences, similar to TAF15 (Hoell et al., 2011). However, several studies have suggested that EWSR1 recognizes a guanine (G)-rich sequence (Ohno et al., 1994; Paronetto et al., 2014). EWSR1 regulates alternative splicing and gene expression for genes involved in many cellular processes, including the DNA damage response, cell growth and apoptosis (Duggimpudi et al., 2015; Huang et al., 2012; Paronetto et al., 2011; 2014). Two mutations within the RGG-rich domain of EWSR1 were identified in sporadic ALS cases in 2012 (Couthouis et al., 2012). The ALS-associated mutations were found to promote cytoplasmic accumulation of mutant EWSR1 in primary mouse neuron cultures and increase aggregation kinetics when compared to the wild-type protein. In Drosophila, overexpression of wild-type EWSR1 leads to neurodegeneration; however, overexpression of mutant EWSR1 does not exacerbate the phenotypes. In postmortem tissue from sporadic ALS patients, EWSR1 was present in cytoplasmic punctate granular structures (Couthouis et al., 2012). Together, these results suggest that EWSR1 has a potential role in conferring toxicity, but further experiments on these mutations and additional studies to identify novel mutations in EWSR1 are required. HnRNPA1 belongs to a family of at least 20 human hnRNPs, which bind to and regulate nascent RNA polymerase II transcripts (Dreyfuss et al., 1993). Structurally, hnRNPA1 contains two RRMs and a Gly-rich domain at the C-terminus (Fig. 1) (Dreyfuss et al., 1993). HnRNPA1 is highly expressed in the nucleus but can shuttle between the nucleus and cytoplasm (Dreyfuss et al., 2002; Michael et al., 1995; Mili et al., 2001; Nakielny et al., 1996; Pinol-Roma and Dreyfuss, 1992; Pollard et al., 1996). HnRNPA1 preferentially binds to UAGGGA/U sequences and cooperates with other hnRNPs to regulate splicing, including splicing of its own transcripts, and pathological splicing events (Chabot et al., 1997; Clower et al., 2010; Huelga et al., 2012; Mayeda and Krainer, 1992; Mohagheghi et al., 2016; Yang et al., 1994). In addition to its role in splicing, hnRNPA1 also has functions in mRNA stability, export, transport, localization, and translation as well as miRNA processing (Alarcon et al., 2015; Cammas et al., 2007; Dreyfuss et al., 2002; Guil and Caceres, 2007; Kwon et al., 1999; Villarroya-Beltri et al., 2013). Moreover, hnRNPA1 is recruited to stress granules upon stress (Guil et al., 2006). Mutations in hnRNPA1 underlie less than 1% of ALS cases (Taylor et al., 2016). Kim and colleagues identified hnRNPA1 missense mutations in a family affected by ALS and in two families with multisystem proteinopathy (MSP) affecting the brain, motor neurons, muscle and bone (Kim et al., 2013). Cytoplasmic accumulation and nuclear clearance of mutant hnRNPA1 were observed in patient muscle tissue (Kim et al., 2013). Interestingly, hnRNPA1 staining in the postmortem tissue of sporadic ALS patients was reduced in the nuclei of motor neurons relative to that of control tissue, and did not colocalize with TDP-43 inclusions (Honda et al., 2015). ALS-associated mutations in the Gly-rich LC domain of hnRNPA1, which mediates phase separation (Molliex et al., 2015), have been shown to increase incorporation into stress granules, strengthen steric zipper motifs and accelerate fibrillization compared to wildtype hnRNPA1 (Kim et al., 2013; Molliex et al., 2015). Additional mutations in hnRNPA1 were later identified by targeted sequencing of sporadic ALS patients and of an ALS family with flail arm syndrome (Couthouis et al., 2014; Liu et al., 2016). HnRNPA1 knockout mice are embryonic lethal, while heterozygous animals display a cardiac phenotype and show many changes in alternative splicing of muscle development-related genes (Liu et al., 2017a). This evidence supports an important role for hnRNPA1 in alternative splicing, but further animal studies are required to investigate its role in ALS pathogenesis. HnRNPA2/B1, another core hnRNP, is similar to hnRNPA1 in structure, expression, and function (Dreyfuss et al., 1993). HnRNPA2 and hnRNPB1 are two isoforms expressed from the same hnRNPA2/B1 gene. By preferentially binding UAGG motifs, this RBP plays a role in alternative splicing and alternative polyadenylation (Alarcon et al., 2015; Burd and Dreyfuss, 1994; Huelga et al., 2012; Martinez et al., 2016). In addition, hnRNPA2/B1 regulates RNA export, transport, localization of transcripts, and miRNA processing (Alarcon et al., 2015; Gao et al., 2008; Munro et al., 1999; Shan et al., 2000; Shan et al., 2003). ALS-associated mutations in hnRNPA2/B1 are extremely rare (< 1%) (Taylor et al., 2016). Exome sequencing and linkage revealed a single mutation in hnRNPA2/B1 in an MSP family (Kim et al., 2013). Targeted sequencing revealed an additional mutation in sporadic ALS patients (Couthouis et al., 2014). Mutant hnRNPA2/B1 displays a similar pathology as mutant hnRNPA1 in patient muscle, where it was cleared from nuclei and accumulated in cytoplasmic inclusions in ~10% of muscle fibers (Kim et al., 2013). Similarly, electroporation of hnRNPA2 into mouse tibialis anterior muscle revealed that while wild-type hnRNPA2 was localized in the nuclei, mutant hnRNPA2 was excluded from nuclei and accumulated in cytoplasmic inclusions (Kim et al., 2013). Drosophila models that express hnRNPA2/B1 also show features reminiscent of myopathy and cytoplasmic protein inclusions (Kim et al., 2013; Li et al., 2016). ALS-associated hnRN-PA2/B1 mutant iPSC-derived motor neurons also displayed hnRNPA2/B1 localization to cytoplasmic granules, abnormal splicing changes, and decreased survival in long-term culture (Martinez et al., 2016). Furthermore, hnRNPA2/B1 knockdown in mice induced alternative splicing changes, neuronal dendrite loss, and learning and memory impairments (Berson et al., 2012). Altogether, the evidence suggests that hnRNPA2/B1 mutations confer susceptibility to ALS. However, further experiments and identification of additional mutations are required to fully support this claim. MATR3 is a component of the nuclear matrix (Berezney and Coffey, 1974; Nakayasu and Berezney, 1991) and contains two RRMs, two Znfs, an NLS and an NES (Fig. 1) (Belgrader et al., 1991; Hibino et al., 2006; Hisada-Ishii et al., 2007). By binding to DNA and RNA, MATR3 regulates transcription, RNA processing, and mRNA export and stability (Banerjee et al., 2017; Boehringer et al., 2017; Coelho et al., 2015; Salton et al., 2011; Skowronska-Krawczyk et al., 2014; Zhang and Carmichael, 2001). Several studies have provided evidence that MATR3 preferentially binds to pyrimidine-rich sequences within intronic regions and controls alternative splicing (Coelho et al., 2015; Uemura et al., 2017). A MATR3 mutation (S85C) was first identified in autosomal-dominant distal myopathy (Senderek et al., 2009). However, in 2014, myopathy in patients with the S85C mutation was reclassified as ALS, and other missense mutations in MATR3 were identified in familial ALS cases (Johnson et al., 2014). Since then, several other missense and splicing mutations have been identified in familial and sporadic ALS cases, although mutations in MATR3 account for less than 1% of all ALS cases (Leblond et al., 2016; Lin et al., 2015; Marangi et al., 2017; Origone et al., 2015; Taylor et al., 2016; Xu et al., 2016). None of these mutations are found in known domains; instead, they are clustered in two regions as shown in Fig. 1. MATR3 staining in ALS postmortem spinal cord tissue is primarily observed in the nucleus. However, in some cases, diffuse cytoplasmic MATR3 or MATR3 inclusions have been observed (Johnson et al., 2014; Tada et al., 2018). For example, intense nuclear and diffuse cytoplasmic MATR3 staining was observed in a patient harboring a MATR3 F115C mutation (Johnson et al., 2014). A very recent study found MATR3 in a subset of cytoplasmic TDP-43-positive inclusions (Tada et al., 2018). However, several studies demonstrated that wild-type or mutant MATR3 was mostly localized in the nucleus even upon stress and that only a small subset of cells overexpressing MATR3 show cytoplasmic puncta resembling stress granules (Gallego-Iradi et al., 2015). A recent paper showed that fibroblasts from S85C myopathy patients exhibited no significant changes in mutant MATR3 localization but showed impaired stress granule formation in response to stress, suggesting that mutant MATR3 may indirectly impact stress granule formation (Mensch et al., 2018). Several recent studies have attempted to identify protein interactors of both wild-type and mutant MATR3; one study found an enrichment of proteins involved in mRNA nuclear export to interact with wild-type MATR3, and these proteins show altered interactions with the mutant form (Boehringer et al., 2017). In contrast, another study did not find significant differences in the interactions with binding partners between wild-type and mutant MATR3 (Iradi et al., 2018). Further studies are required to determine how MATR3 mutations confer pathogenicity. TIA1 is a major component of stress granules (Kedersha et al., 1999; 2000). As shown in Fig. 1, TIA1 is composed of three RRMs and a C-terminal Gly-rich LC domain, which undergoes phase separation (Gilks et al., 2004; Mackenzie et al., 2017). TIA1 binds to uridine (U)-rich sequences (Aznarez et al., 2008; Dember et al., 1996; Piecyk et al., 2000) and is implicated in RNA processing and translation regulation (Del Gatto-Konczak et al., 2000; Dixon et al., 2003; Forch et al., 2000; Kedersha et al., 1999; Piecyk et al., 2000). TIA1 has also been shown to regulate genes involved in multiple processes, including apoptosis, inflammation, and cell proliferation (Dixon et al., 2003; Forch et al., 2000; Heck et al., 2014; Reyes et al., 2009; Sanchez-Jimenez and Izquierdo, 2013). In 2017, several mutations were identified within the C-terminal LC domain of TIA1 in familial and sporadic ALS cases, and several other mutations were found in 2018 (Mackenzie et al., 2017; Yuan et al., 2018; Zhang et al., 2018). Brain and spinal cord autopsy tissue samples with TIA1 mutations revealed cytoplasmic TDP-43 pathology and hyaline Lewy body-like inclusions, but, interestingly, no TIA1 pathology (Hirsch-Reinshagen et al., 2017; Mackenzie et al., 2017). Functional studies revealed that these mutations increased phase separation, delayed stress granule disassembly and promoted accumulation of stress granules harboring TDP-43 (Mackenzie et al., 2017), providing evidence that TIA1 mutations confer pathogenicity. A homozygous TIA1 knockout mouse line exhibited 50% lethality before 3 weeks postpartum, while surviving mice exhibited no gross abnormalities and had normal lifespans (Piecyk et al., 2000). Animal studies will further provide clues as to whether TIA1 gain-of-function, loss-of-function or both lead to ALS pathogenesis. Several RBPs have been identified to be strongly linked with ALS. Many of these proteins share structural and functional properties that mediate their role in the disease process. The most striking structural property shared by many of the RBPs are the LC domains. When harboring ALS-linked mutations in these domains, these RBPs are associated with increased aggregation or fibrillization propensity, cytoplasmic mislocalization, and dysregulation of stress granule dynamics, suggesting that LC domains play an important role in ALS pathogenesis. However, not all ALS-linked RBPs have a defined LC domain (e.g., MATR3 and ATXN2), suggesting that alternative pathogenic mechanisms may exist. By definition, these RBPs play functional roles in RNA metabolism, including transcription, RNA processing, mRNA export and stability, and translation regulation. As such, ALS-linked mutations in these proteins have the potential to affect gene expression and thereby impact certain cellular processes, including the DNA repair response, apoptosis, and cell growth and proliferation. However, it is difficult to pinpoint a single or a few pathway(s) or mechanism(s) by which all these RBPs converge to cause ALS. A better understanding of the normal function as well as pathological significance of these RBPs will be critical to illuminate the biology behind this devastating disease. Fig. 1. The arrowheads indicate single mutations and asterisks denote mutation hotspots found in both familial and sporadic ALS cases. RRM, RNA recognition motif; RGG, arginine/glycine-rich region; Znf, Zinc finger motif; NES, nuclear export signal; NLS, nuclear localization signal; Lsm, like-Sm protein domain; QGSY, glutamine, glycine, serine and tyrosine-rich region; Gly-rich, glycine-rich region; LsmAD, Lsm-associated domain; PAM2, PABP-interacting motif 2; Poly-Q, polyglutamine repeat; a.a., amino acids. Aguilera-Gomez, A., and Rabouille, C. (2017). Membrane-bound organelles versus membrane-less compartments and their control of anabolic pathways in Drosophila. Dev Biol. 428, 310-317. Al-Chalabi, A., van den Berg, L.H., and Veldink, J. (2017). Gene discovery in amyotrophic lateral sclerosis: implications for clinical management. Nat Rev Neurol. 13, 96-104. Alarcon, C.R., Goodarzi, H., Lee, H., Liu, X., Tavazoie, S., and Tavazoie, S.F. (2015). HNRNPA2B1 is a mediator of m(6)A-dependent nuclear RNA processing events. Cell. 162, 1299-1308. Anderson, P., and Kedersha, N. (2009). RNA granules: post-transcriptional and epigenetic modulators of gene expression. Nat Rev Mol Cell Biol. 10, 430-436. Andersson, M.K., Stahlberg, A., Arvidsson, Y., Olofsson, A., Semb, H., Stenman, G., Nilsson, O., and Aman, P. (2008). The multifunctional FUS, EWS and TAF15 proto-oncoproteins show cell type-specific expression patterns and involvement in cell spreading and stress response. BMC Cell Biol. 9, 37. Arai, T., Hasegawa, M., Akiyama, H., Ikeda, K., Nonaka, T., Mori, H., Mann, D., Tsuchiya, K., Yoshida, M., and Hashizume, Y. (2006). TDP-43 is a component of ubiquitin-positive tau-negative inclusions in frontotemporal lobar degeneration and amyotrophic lateral sclerosis. Biochem Biophys Res Commun. 351, 602-611. Auburger, G., Sen, N.E., Meierhofer, D., Basak, A.N., and Gitler, A.D. (2017). Efficient prevention of neurodegenerative diseases by depletion of starvation response factor ataxin-2. Trends Neurosci. 40, 507-516. Aznarez, I., Barash, Y., Shai, O., He, D., Zielenski, J., Tsui, L.C., Parkinson, J., Frey, B.J., Rommens, J.M., and Blencowe, B.J. (2008). A systematic analysis of intronic sequences downstream of 5′ splice sites reveals a widespread role for U-rich motifs and TIA1/TIAL1 proteins in alternative splicing regulation. Genome Res. 18, 1247-1258. Bakthavachalu, B., Huelsmeier, J., Sudhakaran, I.P., Hillebrand, J., Singh, A., Petrauskas, A., Thiagarajan, D., Sankaranarayanan, M., Mizoue, L., and Anderson, E.N. (2018). RNP-granule assembly via ataxin-2 disordered domains is required for long-term memory and neurodegeneration. Neuron. 98, 754-766e754. Banerjee, A., Vest, K.E., Pavlath, G.K., and Corbett, A.H. (2017). Nuclear poly(A) binding protein 1 (PABPN1) and Matrin3 interact in muscle cells and regulate RNA processing. Nucleic Acids Res. 45, 10706-10725. Baumer, D., Hilton, D., Paine, S.M., Turner, M.R., Lowe, J., Talbot, K., and Ansorge, O. (2010). Juvenile ALS with basophilic inclusions is a FUS proteinopathy with FUS mutations. Neurology. 75, 611-618. Becker, L.A., Huang, B., Bieri, G., Ma, R., Knowles, D.A., Jafar-Nejad, P., Messing, J., Kim, H.J., Soriano, A., and Auburger, G. (2017). Therapeutic reduction of ataxin-2 extends lifespan and reduces pathology in TDP-43 mice. Nature. 544, 367-371. Belgrader, P., Dey, R., and Berezney, R. (1991). Molecular cloning of matrin 3. A 125-kilodalton protein of the nuclear matrix contains an extensive acidic domain. J Biol Chem. 266, 9893-9899. Berezney, R., and Coffey, D.S. (1974). Identification of a nuclear protein matrix. Biochem Biophys Res Commun. 60, 1410-1417. Berson, A., Barbash, S., Shaltiel, G., Goll, Y., Hanin, G., Greenberg, D.S., Ketzef, M., Becker, A.J., Friedman, A., and Soreq, H. (2012). Cholinergic-associated loss of hnRNP-A/B in Alzheimer’s disease impairs cortical splicing and cognitive function in mice. EMBO Mol Med. 4, 730-742. Bertolotti, A., Lutz, Y., Heard, D.J., Chambon, P., and Tora, L. (1996). hTAF(II)68, a novel RNA/ssDNA-binding protein with homology to the pro-oncoproteins TLS/FUS and EWS is associated with both TFIID and RNA polymerase II. EMBO J. 15, 5022-5031. Boehringer, A., Garcia-Mansfield, K., Singh, G., Bakkar, N., Pirrotte, P., and Bowser, R. (2017). ALS associated mutations in Matrin 3 alter protein-protein interactions and impede mRNA Nuclear Export. Sci Rep. 7, 14529. Bosco, D.A., Lemay, N., Ko, H.K., Zhou, H., Burke, C., Kwiatkowski, T.J., Sapp, P., McKenna-Yasek, D., Brown, R.H., and Hayward, L.J. (2010). Mutant FUS proteins that cause amyotrophic lateral sclerosis incorporate into stress granules. Hum Mol Genet. 19, 4160-4175. Brangwynne, C.P., Eckmann, C.R., Courson, D.S., Rybarska, A., Hoege, C., Gharakhani, J., Julicher, F., and Hyman, A.A. (2009). Germline P granules are liquid droplets that localize by controlled dissolution/condensation. Science. 324, 1729-1732. Buchan, J.R., and Parker, R. (2009). Eukaryotic stress granules: the ins and outs of translation. Mol Cell. 36, 932-941. Buratti, E., and Baralle, F.E. (2001). Characterization and functional implications of the RNA binding properties of nuclear factor TDP-43, a novel splicing regulator of CFTR exon 9. J Biol Chem. 276, 36337-36343. Buratti, E., and Baralle, F.E. (2008). Multiple roles of TDP-43 in gene expression, splicing regulation, and human disease. Front Biosci. 13, 867-878. Burd, C.G., and Dreyfuss, G. (1994). RNA binding specificity of hnRNP A1: significance of hnRNP A1 high-affinity binding sites in pre-mRNA splicing. EMBO J. 13, 1197-1204. Cammas, A., Pileur, F., Bonnal, S., Lewis, S.M., Leveque, N., Holcik, M., and Vagner, S. (2007). Cytoplasmic relocalization of heterogeneous nuclear ribonucleoprotein A1 controls translation initiation of specific mRNAs. Mol Biol Cell. 18, 5048-5059. Carmo-Silva, S., Nobrega, C., Pereira de Almeida, L., and Cavadas, C. (2017). Unraveling the role of ataxin-2 in metabolism. Trends Endocrinol Metab. 28, 309-318. Chabot, B., Blanchette, M., Lapierre, I., and La Branche, H. (1997). An intron element modulating 5′ splice site selection in the hnRNP A1 pre-mRNA interacts with hnRNP A1. Mol Cell Biol. 17, 1776-1786. Chong, P.A., and Forman-Kay, J.D. (2016). A new phase in ALS Research. Structure. 24, 1435-1436. Clower, C.V., Chatterjee, D., Wang, Z., Cantley, L.C., Vander Heiden, M.G., and Krainer, A.R. (2010). The alternative splicing repressors hnRNP A1/A2 and PTB influence pyruvate kinase isoform expression and cell metabolism. Proc Natl Acad Sci USA. 107, 1894-1899. Coelho, M.B., Attig, J., Bellora, N., Konig, J., Hallegger, M., Kayikci, M., Eyras, E., Ule, J., and Smith, C.W. (2015). Nuclear matrix protein Matrin3 regulates alternative splicing and forms overlapping regulatory networks with PTB. EMBO J. 34, 653-668. Colombrita, C., Zennaro, E., Fallini, C., Weber, M., Sommacal, A., Buratti, E., Silani, V., and Ratti, A. (2009). TDP-43 is recruited to stress granules in conditions of oxidative insult. J Neurochem. 111, 1051-1061. Conforti, F.L., Spataro, R., Sproviero, W., Mazzei, R., Cavalcanti, F., Condino, F., Simone, I.L., Logroscino, G., Patitucci, A., and Magariello, A. (2012). Ataxin-1 and ataxin-2 intermediate-length PolyQ expansions in amyotrophic lateral sclerosis. Neurology. 79, 2315-2320. Conicella, A.E., Zerze, G.H., Mittal, J., and Fawzi, N.L. (2016). ALS mutations disrupt phase separation mediated by α-helical structure in the TDP-43 low-complexity C-terminal domain. Structure. 24, 1537-1549. Couthouis, J., Hart, M.P., Shorter, J., DeJesus-Hernandez, M., Erion, R., Oristano, R., Liu, A.X., Ramos, D., Jethava, N., and Hosangadi, D. (2011). A yeast functional screen predicts new candidate ALS disease genes. Proc Natl Acad Sci USA. 108, 20881-20890. Couthouis, J., Hart, M.P., Erion, R., King, O.D., Diaz, Z., Nakaya, T., Ibrahim, F., Kim, H.J., Mojsilovic-Petrovic, J., and Panossian, S. (2012). Evaluating the role of the FUS/TLS-related gene EWSR1 in amyotrophic lateral sclerosis. Hum Mol Genet. 21, 2899-2911. Couthouis, J., Raphael, A.R., Daneshjou, R., and Gitler, A.D. (2014). Targeted exon capture and sequencing in sporadic amyotrophic lateral sclerosis. PLoS Genet. 10, e1004704. Crozat, A., Aman, P., Mandahl, N., and Ron, D. (1993). Fusion of CHOP to a novel RNA-binding protein in human myxoid liposarcoma. Nature. 363, 640-644. De Santis, R., Santini, L., Colantoni, A., Peruzzi, G., de Turris, V., Alfano, V., Bozzoni, I., and Rosa, A. (2017). FUS Mutant Human Motoneurons Display Altered Transcriptome and microRNA Pathways with Implications for ALS Pathogenesis. Stem Cell Rep. 9, 1450-1462. Del Gatto-Konczak, F., Bourgeois, C.F., Le Guiner, C., Kister, L., Gesnel, M.C., Stevenin, J., and Breathnach, R. (2000). The RNA-binding protein TIA-1 is a novel mammalian splicing regulator acting through intron sequences adjacent to a 5′ splice site. Mol Cell Biol. 20, 6287-6299. Delattre, O., Zucman, J., Plougastel, B., Desmaze, C., Melot, T., Peter, M., Kovar, H., Joubert, I., de Jong, P., and Rouleau, G. (1992). Gene fusion with an ETS DNA-binding domain caused by chromosome translocation in human tumours. Nature. 359, 162-165. Dember, L.M., Kim, N.D., Liu, K.Q., and Anderson, P. (1996). Individual RNA recognition motifs of TIA-1 and TIAR have different RNA binding specificities. J Biol Chem. 271, 2783-2788. Dixon, D.A., Balch, G.C., Kedersha, N., Anderson, P., Zimmerman, G.A., Beauchamp, R.D., and Prescott, S.M. (2003). Regulation of cyclooxygenase-2 expression by the translational silencer TIA-1. J Exp Med. 198, 475-481. Dreyfuss, G., Matunis, M.J., Pinol-Roma, S., and Burd, C.G. (1993). hnRNP proteins and the biogenesis of mRNA. Annu Rev Biochem. 62, 289-321. Dreyfuss, G., Kim, V.N., and Kataoka, N. (2002). Messenger-RNA-binding proteins and the messages they carry. Nat Rev Mol Cell Biol. 3, 195-205. Duggimpudi, S., Larsson, E., Nabhani, S., Borkhardt, A., and Hoell, J.I. (2015). The cell cycle regulator CCDC6 is a key target of RNA-binding protein EWS. PLoS One. 10, e0119066. Elden, A.C., Kim, H.J., Hart, M.P., Chen-Plotkin, A.S., Johnson, B.S., Fang, X., Armakola, M., Geser, F., Greene, R., and Lu, M.M. (2010). Ataxin-2 intermediate-length polyglutamine expansions are associated with increased risk for ALS. Nature. 466, 1069-1075. Farg, M.A., Soo, K.Y., Warraich, S.T., Sundaramoorthy, V., Blair, I.P., and Atkin, J.D. (2013). Ataxin-2 interacts with FUS and intermediate-length polyglutamine expansions enhance FUS-related pathology in amyotrophic lateral sclerosis. Hum Mol Genet. 22, 717-728. Forch, P., Puig, O., Kedersha, N., Martinez, C., Granneman, S., Seraphin, B., Anderson, P., and Valcarcel, J. (2000). The apoptosis-promoting factor TIA-1 is a regulator of alternative pre-mRNA splicing. Mol Cell. 6, 1089-1098. Gallego-Iradi, M.C., Clare, A.M., Brown, H.H., Janus, C., Lewis, J., and Borchelt, D.R. (2015). Subcellular localization of matrin 3 containing mutations associated with ALS and distal myopathy. PLoS One. 10, e0142144. Gao, Y., Tatavarty, V., Korza, G., Levin, M.K., and Carson, J.H. (2008). Multiplexed dendritic targeting of alpha calcium calmodulin-dependent protein kinase II, neurogranin, and activity-regulated cytoskeleton-associated protein RNAs by the A2 pathway. Mol Biol Cell. 19, 2311-2327. Gilks, N., Kedersha, N., Ayodele, M., Shen, L., Stoecklin, G., Dember, L.M., and Anderson, P. (2004). Stress granule assembly is mediated by prion-like aggregation of TIA-1. Mol Biol Cell. 15, 5383-5398. Guerreiro, R., Bras, J., and Hardy, J. (2015). SnapShot: Genetics of ALS and FTD. Cell. 160, 798-798 e791. Guil, S., and Caceres, J.F. (2007). The multifunctional RNA-binding protein hnRNP A1 is required for processing of miR-18a. Nat Struct Mol Biol. 14, 591-596. Guil, S., Long, J.C., and Caceres, J.F. (2006). hnRNP A1 relocalization to the stress granules reflects a role in the stress response. Mol Cell Biol. 26, 5744-5758. Heck, M.V., Azizov, M., Stehning, T., Walter, M., Kedersha, N., and Auburger, G. (2014). Dysregulated expression of lipid storage and membrane dynamics factors in Tia1 knockout mouse nervous tissue. Neurogenetics. 15, 135-144. Hibino, Y., Usui, T., Morita, Y., Hirose, N., Okazaki, M., Sugano, N., and Hiraga, K. (2006). Molecular properties and intracellular localization of rat liver nuclear scaffold protein P130. Biochim Biophys Acta. 1759, 195-207. Hirsch-Reinshagen, V., Pottier, C., Nicholson, A.M., Baker, M., Hsiung, G.R., Krieger, C., Sengdy, P., Boylan, K.B., Dickson, D.W., and Mesulam, M. (2017). Clinical and neuropathological features of ALS/FTD with TIA1 mutations. Acta Neuropathol Commun. 5, 96. Hisada-Ishii, S., Ebihara, M., Kobayashi, N., and Kitagawa, Y. (2007). Bipartite nuclear localization signal of matrin 3 is essential for vertebrate cells. Biochem Biophys Res Commun. 354, 72-76. Hoell, J.I., Larsson, E., Runge, S., Nusbaum, J.D., Duggimpudi, S., Farazi, T.A., Hafner, M., Borkhardt, A., Sander, C., and Tuschl, T. (2011). RNA targets of wild-type and mutant FET family proteins. Nat Struct Mol Biol. 18, 1428-1431. Hofweber, M., Hutten, S., Bourgeois, B., Spreitzer, E., Niedner-Boblenz, A., Schifferer, M., Ruepp, M.D., Simons, M., Niessing, D., and Madl, T. (2018). Phase separation of FUS is suppressed by its nuclear import receptor and arginine methylation. Cell. 173, 706-719 e713. Honda, H., Hamasaki, H., Wakamiya, T., Koyama, S., Suzuki, S.O., Fujii, N., and Iwaki, T. (2015). Loss of hnRNPA1 in ALS spinal cord motor neurons with TDP-43-positive inclusions. Neuropathology. 35, 37-43. Huang, E.J., Zhang, J., Geser, F., Trojanowski, J.Q., Strober, J.B., Dickson, D.W., Brown, R.H., Shapiro, B.E., and Lomen-Hoerth, C. (2010). Extensive FUS-immunoreactive pathology in juvenile amyotrophic lateral sclerosis with basophilic inclusions. Brain Pathol. 20, 1069-1076. Huang, L., Nakai, Y., Kuwahara, I., and Matsumoto, K. (2012). PRAS40 is a functionally critical target for EWS repression in Ewing sarcoma. Cancer Res. 72, 1260-1269. Huelga, S.C., Vu, A.Q., Arnold, J.D., Liang, T.Y., Liu, P.P., Yan, B.Y., Donohue, J.P., Shiue, L., Hoon, S., and Brenner, S. (2012). Integrative genome-wide analysis reveals cooperative regulation of alternative splicing by hnRNP proteins. Cell Rep. 1, 167-178. Ibrahim, F., Maragkakis, M., Alexiou, P., Maronski, M.A., Dichter, M.A., and Mourelatos, Z. (2013). Identification of in vivo, conserved, TAF15 RNA binding sites reveals the impact of TAF15 on the neuronal transcriptome. Cell Rep. 3, 301-308. Ichiyanagi, N., Fujimori, K., Yano, M., Ishihara-Fujisaki, C., Sone, T., Akiyama, T., Okada, Y., Akamatsu, W., Matsumoto, T., and Ishikawa, M. (2016). Establishment of in vitro FUS-associated familial amyotrophic lateral sclerosis model using human induced pluripotent stem cells. Stem Cell Rep. 6, 496-510. Iguchi, Y., Katsuno, M., Niwa, J., Takagi, S., Ishigaki, S., Ikenaka, K., Kawai, K., Watanabe, H., Yamanaka, K., and Takahashi, R. (2013). Loss of TDP-43 causes age-dependent progressive motor neuron degeneration. Brain. 136, 1371-1382. Imbert, G., Saudou, F., Yvert, G., Devys, D., Trottier, Y., Garnier, J.M., Weber, C., Mandel, J.L., Cancel, G., and Abbas, N. (1996). Cloning of the gene for spinocerebellar ataxia 2 reveals a locus with high sensitivity to expanded CAG/glutamine repeats. Nat Genet. 14, 285-291. Iradi, M.C.G., Triplett, J.C., Thomas, J.D., Davila, R., Crown, A.M., Brown, H., Lewis, J., Swanson, M.S., Xu, G., and Rodriguez-Lebron, E. (2018). Characterization of gene regulation and protein interaction networks for Matrin 3 encoding mutations linked to amyotrophic lateral sclerosis and myopathy. Sci Rep. 8, 4049. Izhar, L., Adamson, B., Ciccia, A., Lewis, J., Pontano-Vaites, L., Leng, Y., Liang, A.C., Westbrook, T.F., Harper, J.W., and Elledge, S.J. (2015). A systematic analysis of factors localized to damaged chromatin reveals PARP-dependent recruitment of transcription factors. Cell Rep. 11, 1486-1500. Jain, S., Wheeler, J.R., Walters, R.W., Agrawal, A., Barsic, A., and Parker, R. (2016). ATPase-modulated stress granules contain a diverse proteome and substructure. Cell. 164, 487-498. Jobert, L., Pinzon, N., Van Herreweghe, E., Jady, B.E., Guialis, A., Kiss, T., and Tora, L. (2009). Human U1 snRNA forms a new chromatin-associated snRNP with TAF15. EMBO Rep. 10, 494-500. Johnson, J.O., Pioro, E.P., Boehringer, A., Chia, R., Feit, H., Renton, A.E., Pliner, H.A., Abramzon, Y., Marangi, G., and Winborn, B.J. (2014). Mutations in the Matrin 3 gene cause familial amyotrophic lateral sclerosis. Nat Neurosci. 17, 664-666. Kapeli, K., Pratt, G.A., Vu, A.Q., Hutt, K.R., Martinez, F.J., Sundararaman, B., Batra, R., Freese, P., Lambert, N.J., and Huelga, S.C. (2016). Distinct and shared functions of ALS-associated proteins TDP-43, FUS and TAF15 revealed by multisystem analyses. Nat Commun. 7, 12143. Kapeli, K., Martinez, F.J., and Yeo, G.W. (2017). Genetic mutations in RNA-binding proteins and their roles in ALS. Hum Genet. 136, 1193-1214. Kashyap, M., Ganguly, A.K., and Bhavesh, N.S. (2015). Structural delineation of stem-loop RNA binding by human TAF15 protein. Sci Rep. 5, 17298. Kedersha, N.L., Gupta, M., Li, W., Miller, I., and Anderson, P. (1999). RNA-binding proteins TIA-1 and TIAR link the phosphorylation of eIF-2 alpha to the assembly of mammalian stress granules. J Cell Biol. 147, 1431-1442. Kedersha, N., Cho, M.R., Li, W., Yacono, P.W., Chen, S., Gilks, N., Golan, D.E., and Anderson, P. (2000). Dynamic shuttling of TIA-1 accompanies the recruitment of mRNA to mammalian stress granules. J Cell Biol. 151, 1257-1268. Kim, H.J., Kim, N.C., Wang, Y.D., Scarborough, E.A., Moore, J., Diaz, Z., MacLea, K.S., Freibaum, B., Li, S., and Molliex, A. (2013). Mutations in prion-like domains in hnRNPA2B1 and hnRNPA1 cause multisystem proteinopathy and ALS. Nature. 495, 467-473. Kwiatkowski, T.J., Bosco, D.A., Leclerc, A.L., Tamrazian, E., Vanderburg, C.R., Russ, C., Davis, A., Gilchrist, J., Kasarskis, E.J., and Munsat, T. (2009). Mutations in the FUS/TLS gene on chromosome 16 cause familial amyotrophic lateral sclerosis. Science. 323, 1205-1208. Kwon, S., Barbarese, E., and Carson, J.H. (1999). The cis-acting RNA trafficking signal from myelin basic protein mRNA and its cognate trans-acting ligand hnRNP A2 enhance cap-dependent translation. J Cell Biol. 147, 247-256. Lagier-Tourenne, C., Polymenidou, M., Hutt, K.R., Vu, A.Q., Baughn, M., Huelga, S.C., Clutario, K.M., Ling, S.C., Liang, T.Y., and Mazur, C. (2012). Divergent roles of ALS-linked proteins FUS/TLS and TDP-43 intersect in processing long pre-mRNAs. Nat Neurosci. 15, 1488-1497. Lanson, N.A., and Pandey, U.B. (2012). FUS-related proteinopathies: lessons from animal models. Brain Res. 1462, 44-60. Leblond, C.S., Gan-Or, Z., Spiegelman, D., Laurent, S.B., Szuto, A., Hodgkinson, A., Dionne-Laporte, A., Provencher, P., de Carvalho, M., and Orru, S. (2016). Replication study of MATR3 in familial and sporadic amyotrophic lateral sclerosis. Neurobiol Aging. 37, 209 e217-209 e221. Lee, T., Li, Y.R., Ingre, C., Weber, M., Grehl, T., Gredal, O., de Carvalho, M., Meyer, T., Tysnes, O.B., and Auburger, G. (2011). Ataxin-2 intermediate-length polyglutamine expansions in European ALS patients. Hum Mol Genet. 20, 1697-1700. Lee, J., Kim, M., Itoh, T.Q., and Lim, C. (2018a). Ataxin-2: A versatile posttranscriptional regulator and its implication in neural function. Wiley Interdiscip Rev RNA, e1488. Lee, Y., Jonson, P.H., Sarparanta, J., Palmio, J., Sarkar, M., Vihola, A., Evila, A., Suominen, T., Penttila, S., and Savarese, M. (2018b). TIA1 variant drives myodegeneration in multisystem proteinopathy with SQSTM1 mutations. J Clin Invest. 128, 1164-1177. Li, Y.R., King, O.D., Shorter, J., and Gitler, A.D. (2013). Stress granules as crucibles of ALS pathogenesis. J Cell Biol. 201, 361-372. Li, S., Zhang, P., Freibaum, B.D., Kim, N.C., Kolaitis, R.M., Molliex, A., Kanagaraj, A.P., Yabe, I., Tanino, M., and Tanaka, S. (2016). Genetic interaction of hnRNPA2B1 and DNAJB6 in a Drosophila model of multisystem proteinopathy. Hum Mol Genet. 25, 936-950. Lim, C., and Allada, R. (2013). ATAXIN-2 activates PERIOD translation to sustain circadian rhythms in Drosophila. Science. 340, 875-879. Lin, K.P., Tsai, P.C., Liao, Y.C., Chen, W.T., Tsai, C.P., Soong, B.W., and Lee, Y.C. (2015). Mutational analysis of MATR3 in Taiwanese patients with amyotrophic lateral sclerosis. Neurobiol Aging. 36, 2005 e2001-2004. Ling, J.P., Pletnikova, O., Troncoso, J.C., and Wong, P.C. (2015). TDP-43 repression of nonconserved cryptic exons is compromised in ALS-FTD. Science. 349, 650-655. Liu, Y.C., Chiang, P.M., and Tsai, K.J. (2013). Disease animal models of TDP-43 proteinopathy and their pre-clinical applications. Int J Mol Sci. 14, 20079-20111. Liu, Q., Shu, S., Wang, R.R., Liu, F., Cui, B., Guo, X.N., Lu, C.X., Li, X.G., Liu, M.S., and Peng, B. (2016). Whole-exome sequencing identifies a missense mutation in hnRNPA1 in a family with flail arm ALS. Neurology. 87, 1763-1769. Liu, T.Y., Chen, Y.C., Jong, Y.J., Tsai, H.J., Lee, C.C., Chang, Y.S., Chang, J.G., and Chang, Y.F. (2017a). Muscle developmental defects in heterogeneous nuclear Ribonucleoprotein A1 knockout mice. Open Biol. 7. Liu, Z.J., Lin, H.X., Liu, G.L., Tao, Q.Q., Ni, W., Xiao, B.G., and Wu, Z.Y. (2017b). The investigation of genetic and clinical features in Chinese patients with juvenile amyotrophic lateral sclerosis. Clin Genet. 92, 267-273. Liu-Yesucevitz, L., Bilgutay, A., Zhang, Y.J., Vanderweyde, T., Citro, A., Mehta, T., Zaarur, N., McKee, A., Bowser, R., and Sherman, M. (2010). Tar DNA binding protein-43 (TDP-43) associates with stress granules: analysis of cultured cells and pathological brain tissue. PLoS One. 5, e13250. Lu, H.P., Gan, S.R., Chen, S., Li, H.F., Liu, Z.J., Ni, W., Wang, N., and Wu, Z.Y. (2015). Intermediate-length polyglutamine in ATXN2 is a possible risk factor among Eastern Chinese patients with amyotrophic lateral sclerosis. Neurobiol Aging. 36, 1603 e1611-1604. Luo, F., Gui, X., Zhou, H., Gu, J., Li, Y., Liu, X., Zhao, M., Li, D., Li, X., and Liu, C. (2018). Atomic structures of FUS LC domain segments reveal bases for reversible amyloid fibril formation. Nat Struct Mol Biol. 25, 341-346. Mackenzie, I.R., Bigio, E.H., Ince, P.G., Geser, F., Neumann, M., Cairns, N.J., Kwong, L.K., Forman, M.S., Ravits, J., and Stewart, H. (2007). Pathological TDP-43 distinguishes sporadic amyotrophic lateral sclerosis from amyotrophic lateral sclerosis with SOD1 mutations. Ann Neurol. 61, 427-434. Mackenzie, I.R., Nicholson, A.M., Sarkar, M., Messing, J., Purice, M.D., Pottier, C., Annu, K., Baker, M., Perkerson, R.B., and Kurti, A. (2017). TIA1 mutations in amyotrophic lateral sclerosis and frontotemporal dementia promote phase separation and alter stress granule dynamics. Neuron. 95, 808-816 e809. Marangi, G., Lattante, S., Doronzio, P.N., Conte, A., Tasca, G., Monforte, M., Patanella, A.K., Bisogni, G., Meleo, E., and La Spada, S. (2017). Matrin 3 variants are frequent in Italian ALS patients. Neurobiol Aging. 49, 218 e211-218 e217. Marko, M., Vlassis, A., Guialis, A., and Leichter, M. (2012). Domains involved in TAF15 subcellular localisation: dependence on cell type and ongoing transcription. Gene. 506, 331-338. Martinez, F.J., Pratt, G.A., Van Nostrand, E.L., Batra, R., Huelga, S.C., Kapeli, K., Freese, P., Chun, S.J., Ling, K., and Gelboin-Burkhart, C. (2016). Protein-RNA networks regulated by normal and ALS-associated mutant HNRNPA2B1 in the nervous system. Neuron. 92, 780-795. Mayeda, A., and Krainer, A.R. (1992). Regulation of alternative pre-mRNA splicing by hnRNP A1 and splicing factor SF2. Cell. 68, 365-375. Mensch, A., Meinhardt, B., Bley, N., Huttelmaier, S., Schneider, I., Stoltenburg-Didinger, G., Kraya, T., Muller, T., and Zierz, S. (2018). The p.S85C-mutation in MATR3 impairs stress granule formation in Matrin-3 myopathy. Exp Neurol. 306, 222-231. Michael, W.M., Choi, M., and Dreyfuss, G. (1995). A nuclear export signal in hnRNP A1: a signal-mediated, temperature-dependent nuclear protein export pathway. Cell. 83, 415-422. Mili, S., Shu, H.J., Zhao, Y., and Pinol-Roma, S. (2001). Distinct RNP complexes of shuttling hnRNP proteins with pre-mRNA and mRNA: candidate intermediates in formation and export of mRNA. Mol Cell Biol. 21, 7307-7319. Mitchell, J.C., McGoldrick, P., Vance, C., Hortobagyi, T., Sreedharan, J., Rogelj, B., Tudor, E.L., Smith, B.N., Klasen, C., and Miller, C.C. (2013). Overexpression of human wild-type FUS causes progressive motor neuron degeneration in an age- and dose-dependent fashion. Acta Neuropathol. 125, 273-288. Mohagheghi, F., Prudencio, M., Stuani, C., Cook, C., Jansen-West, K., Dickson, D.W., Petrucelli, L., and Buratti, E. (2016). TDP-43 functions within a network of hnRNP proteins to inhibit the production of a truncated human SORT1 receptor. Hum Mol Genet. 25, 534-545. Molliex, A., Temirov, J., Lee, J., Coughlin, M., Kanagaraj, A.P., Kim, H.J., Mittag, T., and Taylor, J.P. (2015). Phase separation by low complexity domains promotes stress granule assembly and drives pathological fibrillization. Cell. 163, 123-133. Monahan, Z., Shewmaker, F., and Pandey, U.B. (2016). Stress granules at the intersection of autophagy and ALS. Brain Res. 1649, 189-200. Morohoshi, F., Arai, K., Takahashi, E.I., Tanigami, A., and Ohki, M. (1996). Cloning and mapping of a human RBP56 gene encoding a putative RNA binding protein similar to FUS/TLS and EWS proteins. Genomics. 38, 51-57. Munro, T.P., Magee, R.J., Kidd, G.J., Carson, J.H., Barbarese, E., Smith, L.M., and Smith, R. (1999). Mutational analysis of a heterogeneous nuclear ribonucleoprotein A2 response element for RNA trafficking. J Biol Chem. 274, 34389-34395. Murakami, T., Qamar, S., Lin, J.Q., Schierle, G.S., Rees, E., Miyashita, A., Costa, A.R., Dodd, R.B., Chan, F.T., and Michel, C.H. (2015). ALS/FTD mutation-induced phase transition of FUS liquid droplets and reversible hydrogels into irreversible hydrogels impairs RNP granule function. Neuron. 88, 678-690. Murray, D.T., Kato, M., Lin, Y., Thurber, K.R., Hung, I., McKnight, S.L., and Tycko, R. (2017). Structure of FUS protein fibrils and its relevance to self-assembly and phase separation of low-complexity domains. Cell. 171, 615-627 e616. Nakayasu, H., and Berezney, R. (1991). Nuclear matrins: identification of the major nuclear matrix proteins. Proc Natl Acad Sci USA. 88, 10312-10316. Nakielny, S., Siomi, M.C., Siomi, H., Michael, W.M., Pollard, V., and Dreyfuss, G. (1996). Transportin: nuclear transport receptor of a novel nuclear protein import pathway. Exp Cell Res. 229, 261-266. Neumann, M., Sampathu, D.M., Kwong, L.K., Truax, A.C., Micsenyi, M.C., Chou, T.T., Bruce, J., Schuck, T., Grossman, M., and Clark, C.M. (2006). Ubiquitinated TDP-43 in frontotemporal lobar degeneration and amyotrophic lateral sclerosis. Science. 314, 130-133. Neumann, M., Bentmann, E., Dormann, D., Jawaid, A., DeJesus-Hernandez, M., Ansorge, O., Roeber, S., Kretzschmar, H.A., Munoz, D.G., and Kusaka, H. (2011). FET proteins TAF15 and EWS are selective markers that distinguish FTLD with FUS pathology from amyotrophic lateral sclerosis with FUS mutations. Brain. 134, 2595-2609. Nonhoff, U., Ralser, M., Welzel, F., Piccini, I., Balzereit, D., Yaspo, M.L., Lehrach, H., and Krobitsch, S. (2007). Ataxin-2 interacts with the DEAD/H-box RNA helicase DDX6 and interferes with P-bodies and stress granules. Mol Biol Cell. 18, 1385-1396. Ohno, T., Ouchida, M., Lee, L., Gatalica, Z., Rao, V.N., and Reddy, E.S. (1994). The EWS gene, involved in Ewing family of tumors, malignant melanoma of soft parts and desmoplastic small round cell tumors, codes for an RNA binding protein with novel regulatory domains. Oncogene. 9, 3087-3097. Origone, P., Verdiani, S., Bandettini Di Poggio, M., Zuccarino, R., Vignolo, M., Caponnetto, C., and Mandich, P. (2015). A novel Arg147Trp MATR3 missense mutation in a slowly progressive ALS Italian patient. Amyotroph Lateral Scler Frontotemporal Degener. 16, 530-531. Ostrowski, L.A., Hall, A.C., and Mekhail, K. (2017). Ataxin-2: From RNA control to human health and disease. Genes (Basel). 8. Paronetto, M.P., Minana, B., and Valcarcel, J. (2011). The Ewing sarcoma protein regulates DNA damage-induced alternative splicing. Mol Cell. 43, 353-368. Paronetto, M.P., Bernardis, I., Volpe, E., Bechara, E., Sebestyen, E., Eyras, E., and Valcarcel, J. (2014). Regulation of FAS exon definition and apoptosis by the Ewing sarcoma protein. Cell Rep. 7, 1211-1226. Patel, A., Lee, H.O., Jawerth, L., Maharana, S., Jahnel, M., Hein, M.Y., Stoynov, S., Mahamid, J., Saha, S., and Franzmann, T.M. (2015). A liquid-to-solid phase transition of the ALS protein FUS accelerated by disease mutation. Cell. 162, 1066-1077. Picher-Martel, V., Valdmanis, P.N., Gould, P.V., Julien, J.P., and Dupre, N. (2016). From animal models to human disease: a genetic approach for personalized medicine in ALS. Acta Neuropathol Commun. 4, 70. Piecyk, M., Wax, S., Beck, A.R., Kedersha, N., Gupta, M., Maritim, B., Chen, S., Gueydan, C., Kruys, V., and Streuli, M. (2000). TIA-1 is a translational silencer that selectively regulates the expression of TNF-alpha. EMBO J. 19, 4154-4163. Pinol-Roma, S., and Dreyfuss, G. (1992). Shuttling of pre-mRNA binding proteins between nucleus and cytoplasm. Nature. 355, 730-732. Pollard, V.W., Michael, W.M., Nakielny, S., Siomi, M.C., Wang, F., and Dreyfuss, G. (1996). A novel receptor-mediated nuclear protein import pathway. Cell. 86, 985-994. Polymenidou, M., Lagier-Tourenne, C., Hutt, K.R., Huelga, S.C., Moran, J., Liang, T.Y., Ling, S.C., Sun, E., Wancewicz, E., and Mazur, C. (2011). Long pre-mRNA depletion and RNA missplicing contribute to neuronal vulnerability from loss of TDP-43. Nat Neurosci. 14, 459-468. Purice, M.D., and Taylor, J.P. (2018). Linking hnRNP Function to ALS and FTD Pathology. Front Neurosci. 12, 326. Qamar, S., Wang, G., Randle, S.J., Ruggeri, F.S., Varela, J.A., Lin, J.Q., Phillips, E.C., Miyashita, A., Williams, D., and Strohl, F. (2018). FUS phase separation is modulated by a molecular chaperone and methylation of arginine cation-pi interactions. Cell. 173, 720-734 e715. Qiu, H., Lee, S., Shang, Y., Wang, W.Y., Au, K.F., Kamiya, S., Barmada, S.J., Finkbeiner, S., Lui, H., and Carlton, C.E. (2014). ALS-associated mutation FUS-R521C causes DNA damage and RNA splicing defects. J Clin Invest. 124, 981-999. Rabbitts, T.H., Forster, A., Larson, R., and Nathan, P. (1993). Fusion of the dominant negative transcription regulator CHOP with a novel gene FUS by translocation t(12;16) in malignant liposarcoma. Nat Genet. 4, 175-180. Ralser, M., Albrecht, M., Nonhoff, U., Lengauer, T., Lehrach, H., and Krobitsch, S. (2005). An integrative approach to gain insights into the cellular function of human ataxin-2. J Mol Biol. 346, 203-214. Reyes, R., Alcalde, J., and Izquierdo, J.M. (2009). Depletion of T-cell intracellular antigen proteins promotes cell proliferation. Genome Biol. 10, R87. Rogelj, B., Easton, L.E., Bogu, G.K., Stanton, L.W., Rot, G., Curk, T., Zupan, B., Sugimoto, Y., Modic, M., and Haberman, N. (2012). Widespread binding of FUS along nascent RNA regulates alternative splicing in the brain. Sci Rep. 2, 603. Ross, O.A., Rutherford, N.J., Baker, M., Soto-Ortolaza, A.I., Carrasquillo, M.M., DeJesus-Hernandez, M., Adamson, J., Li, M., Volkening, K., and Finger, E. (2011). Ataxin-2 repeat-length variation and neurodegeneration. Hum Mol Genet. 20, 3207-3212. Rowland, L.P., and Shneider, N.A. (2001). Amyotrophic lateral sclerosis. N Engl J Med. 344, 1688-1700. Salton, M., Elkon, R., Borodina, T., Davydov, A., Yaspo, M.L., Halperin, E., and Shiloh, Y. (2011). Matrin 3 binds and stabilizes mRNA. PLoS One. 6, e23882. Sanchez-Jimenez, C., and Izquierdo, J.M. (2013). T-cell intracellular antigen (TIA)-proteins deficiency in murine embryonic fibroblasts alters cell cycle progression and induces autophagy. PLoS One. 8, e75127. Satterfield, T.F., and Pallanck, L.J. (2006). Ataxin-2 and its Drosophila homolog, ATX2, physically assemble with polyribosomes. Hum Mol Genet. 15, 2523-2532. Senderek, J., Garvey, S.M., Krieger, M., Guergueltcheva, V., Urtizberea, A., Roos, A., Elbracht, M., Stendel, C., Tournev, I., and Mihailova, V. (2009). Autosomal-dominant distal myopathy associated with a recurrent missense mutation in the gene encoding the nuclear matrix protein, matrin 3. Am J Hum Genet. 84, 511-518. Sephton, C.F., Cenik, C., Kucukural, A., Dammer, E.B., Cenik, B., Han, Y., Dewey, C.M., Roth, F.P., Herz, J., and Peng, J. (2011). Identification of neuronal RNA targets of TDP-43-containing ribonucleoprotein complexes. J Biol Chem. 286, 1204-1215. Sephton, C.F., Tang, A.A., Kulkarni, A., West, J., Brooks, M., Stubblefield, J.J., Liu, Y., Zhang, M.Q., Green, C.B., and Huber, K.M. (2014). Activity-dependent FUS dysregulation disrupts synaptic homeostasis. Proc Natl Acad Sci USA. 111, E4769-4778. Shan, J., Moran-Jones, K., Munro, T.P., Kidd, G.J., Winzor, D.J., Hoek, K.S., and Smith, R. (2000). Binding of an RNA trafficking response element to heterogeneous nuclear ribonucleoproteins A1 and A2. J Biol Chem. 275, 38286-38295. Shan, J., Munro, T.P., Barbarese, E., Carson, J.H., and Smith, R. (2003). A molecular mechanism for mRNA trafficking in neuronal dendrites. J Neurosci. 23, 8859-8866. Shang, Y., and Huang, E.J. (2016). Mechanisms of FUS mutations in familial amyotrophic lateral sclerosis. Brain Res. 1647, 65-78. Sharma, A., Lyashchenko, A.K., Lu, L., Nasrabady, S.E., Elmaleh, M., Mendelsohn, M., Nemes, A., Tapia, J.C., Mentis, G.Z., and Shneider, N.A. (2016). ALS-associated mutant FUS induces selective motor neuron degeneration through toxic gain of function. Nat Commun. 7, 10465. Shelkovnikova, T.A., Peters, O.M., Deykin, A.V., Connor-Robson, N., Robinson, H., Ustyugov, A.A., Bachurin, S.O., Ermolkevich, T.G., Goldman, I.L., and Sadchikova, E.R. (2013). Fused in sarcoma (FUS) protein lacking nuclear localization signal (NLS) and major RNA binding motifs triggers proteinopathy and severe motor phenotype in transgenic mice. J Biol Chem. 288, 25266-25274. Skowronska-Krawczyk, D., Ma, Q., Schwartz, M., Scully, K., Li, W., Liu, Z., Taylor, H., Tollkuhn, J., Ohgi, K.A., and Notani, D. (2014). Required enhancer-matrin-3 network interactions for a homeodomain transcription program. Nature. 514, 257-261. Sreedharan, J., Blair, I.P., Tripathi, V.B., Hu, X., Vance, C., Rogelj, B., Ackerley, S., Durnall, J.C., Williams, K.L., and Buratti, E. (2008). TDP-43 mutations in familial and sporadic amyotrophic lateral sclerosis. Science. 319, 1668-1672. Tada, M., Doi, H., Koyano, S., Kubota, S., Fukai, R., Hashiguchi, S., Hayashi, N., Kawamoto, Y., Kunii, M., and Tanaka, K. (2018). Matrin 3 is a component of neuronal cytoplasmic inclusions of motor neurons in sporadic amyotrophic lateral sclerosis. Am J Pathol. 188, 507-514. Tan, Q., Yalamanchili, H.K., Park, J., De Maio, A., Lu, H.C., Wan, Y.W., White, J.J., Bondar, V.V., Sayegh, L.S., and Liu, X. (2016). Extensive cryptic splicing upon loss of RBM17 and TDP43 in neurodegeneration models. Hum Mol Genet. 25, 5083-5093. Taylor, J.P., Brown, R.H., and Cleveland, D.W. (2016). Decoding ALS: from genes to mechanism. Nature. 539, 197-206. Ticozzi, N., Vance, C., Leclerc, A.L., Keagle, P., Glass, J.D., McKenna-Yasek, D., Sapp, P.C., Silani, V., Bosco, D.A., and Shaw, C.E. (2011). Mutational analysis reveals the FUS homolog TAF15 as a candidate gene for familial amyotrophic lateral sclerosis. Am J Med Genet B Neuropsychiatr Genet. 156B, 285-290. Tollervey, J.R., Curk, T., Rogelj, B., Briese, M., Cereda, M., Kayikci, M., Konig, J., Hortobagyi, T., Nishimura, A.L., and Zupunski, V. (2011). Characterizing the RNA targets and position-dependent splicing regulation by TDP-43. Nat Neurosci. 14, 452-458. Uemura, Y., Oshima, T., Yamamoto, M., Reyes, C.J., Costa Cruz, P.H., Shibuya, T., and Kawahara, Y. (2017). Matrin3 binds directly to intronic pyrimidine-rich sequences and controls alternative splicing. Genes Cells. 22, 785-798. Van Damme, P., Veldink, J.H., van Blitterswijk, M., Corveleyn, A., van Vught, P.W., Thijs, V., Dubois, B., Matthijs, G., van den Berg, L.H., and Robberecht, W. (2011). Expanded ATXN2 CAG repeat size in ALS identifies genetic overlap between ALS and SCA2. Neurology. 76, 2066-2072. Van Deerlin, V.M., Leverenz, J.B., Bekris, L.M., Bird, T.D., Yuan, W., Elman, L.B., Clay, D., Wood, E.M., Chen-Plotkin, A.S., and Martinez-Lage, M. (2008). TARDBP mutations in amyotrophic lateral sclerosis with TDP-43 neuropathology: a genetic and histopathological analysis. Lancet Neurol. 7, 409-416. Vance, C., Rogelj, B., Hortobagyi, T., De Vos, K.J., Nishimura, A.L., Sreedharan, J., Hu, X., Smith, B., Ruddy, D., and Wright, P. (2009). Mutations in FUS, an RNA processing protein, cause familial amyotrophic lateral sclerosis type 6. Science. 323, 1208-1211. Vanden Broeck, L., Callaerts, P., and Dermaut, B. (2014). TDP-43-mediated neurodegeneration: towards a loss-of-function hypothesis?. Trends Mol Med. 20, 66-71. Villarroya-Beltri, C., Gutierrez-Vazquez, C., Sanchez-Cabo, F., Perez-Hernandez, D., Vazquez, J., Martin-Cofreces, N., Martinez-Herrera, D.J., Pascual-Montano, A., Mittelbrunn, M., and Sanchez-Madrid, F. (2013). Sumoylated hnRNPA2B1 controls the sorting of miRNAs into exosomes through binding to specific motifs. Nat Commun. 4, 2980. Wegorzewska, I., Bell, S., Cairns, N.J., Miller, T.M., and Baloh, R.H. (2009). TDP-43 mutant transgenic mice develop features of ALS and frontotemporal lobar degeneration. Proc Natl Acad Sci USA. 106, 18809-18814. Winton, M.J., Igaz, L.M., Wong, M.M., Kwong, L.K., Trojanowski, J.Q., and Lee, V.M. (2008). Disturbance of nuclear and cytoplasmic TAR DNA-binding protein (TDP-43) induces disease-like redistribution, sequestration, and aggregate formation. J Biol Chem. 283, 13302-13309. Wroe, R., Wai-Ling Butler, A., Andersen, P.M., Powell, J.F., and Al-Chalabi, A. (2008). ALSOD: the Amyotrophic Lateral Sclerosis Online Database. Amyotroph Lateral Scler. 9, 249-250. Xiao, S., Sanelli, T., Dib, S., Sheps, D., Findlater, J., Bilbao, J., Keith, J., Zinman, L., Rogaeva, E., and Robertson, J. (2011). RNA targets of TDP-43 identified by UV-CLIP are deregulated in ALS. Mol Cell Neurosci. 47, 167-180. Xiao, S., Sanelli, T., Chiang, H., Sun, Y., Chakrabartty, A., Keith, J., Rogaeva, E., Zinman, L., and Robertson, J. (2015). Low molecular weight species of TDP-43 generated by abnormal splicing form inclusions in amyotrophic lateral sclerosis and result in motor neuron death. Acta Neuropathol. 130, 49-61. Xu, L., Li, J., Tang, L., Zhang, N., and Fan, D. (2016). MATR3 mutation analysis in a Chinese cohort with sporadic amyotrophic lateral sclerosis. Neurobiol Aging. 38, 218 e213-218 e214. Yan, J., Deng, H.X., Siddique, N., Fecto, F., Chen, W., Yang, Y., Liu, E., Donkervoort, S., Zheng, J.G., and Shi, Y. (2010). Frameshift and novel mutations in FUS in familial amyotrophic lateral sclerosis and ALS/dementia. Neurology. 75, 807-814. Yang, X., Bani, M.R., Lu, S.J., Rowan, S., Ben-David, Y., and Chabot, B. (1994). The A1 and A1B proteins of heterogeneous nuclear ribonucleoparticles modulate 5′ splice site selection in vivo. Proc Natl Acad Sci USA. 91, 6924-6928. Yokoshi, M., Li, Q., Yamamoto, M., Okada, H., Suzuki, Y., and Kawahara, Y. (2014). Direct binding of Ataxin-2 to distinct elements in 3′ UTRs promotes mRNA stability and protein expression. Mol Cell. 55, 186-198. Yoshizawa, T., Ali, R., Jiou, J., Fung, H.Y.J., Burke, K.A., Kim, S.J., Lin, Y., Peeples, W.B., Saltzberg, D., and Soniat, M. (2018). Nuclear Import Receptor Inhibits Phase Separation of FUS through Binding to Multiple Sites. Cell. 173, 693-705 e622. Yuan, Z., Jiao, B., Hou, L., Xiao, T., Liu, X., Wang, J., Xu, J., Zhou, L., Yan, X., and Tang, B. (2018). Mutation analysis of the TIA1 gene in Chinese patients with amyotrophic lateral sclerosis and frontotemporal dementia. Neurobiol Aging. 64, 160 e169-160 e112. Zakaryan, R.P., and Gehring, H. (2006). Identification and characterization of the nuclear localization/retention signal in the EWS proto-oncoprotein. J Mol Biol. 363, 27-38. Zhang, Z., and Carmichael, G.G. (2001). The fate of dsRNA in the nucleus: a p54(nrb)-containing complex mediates the nuclear retention of promiscuously A-to-I edited RNAs. Cell. 106, 465-475. Zhang, K., Liu, Q., Shen, D., Tai, H., Fu, H., Liu, S., Wang, Z., Shi, J., Ding, Q., and Li, X. (2018). Genetic analysis of TIA1 gene in Chinese patients with amyotrophic lateral sclerosis. Neurobiol Aging.